I am so excited to have my daughter Alex with me in the kitchen for Rosh Hashanah, making this new fusion recipe! This year I have decided to be a little daring. I have taken the traditional Gefilte Fish recipe I learned from my Mother-in-law, (Bobe), and have changed the types of fish she combines. With the traditionally used carp, I combine red snapper, and I finish by cooking the fish in a tangy yet sweet Mediterranean style sauce, which originated in the Mexican state of Veracruz. This recipe adds a flair to Gefilte Fish unlike any other. 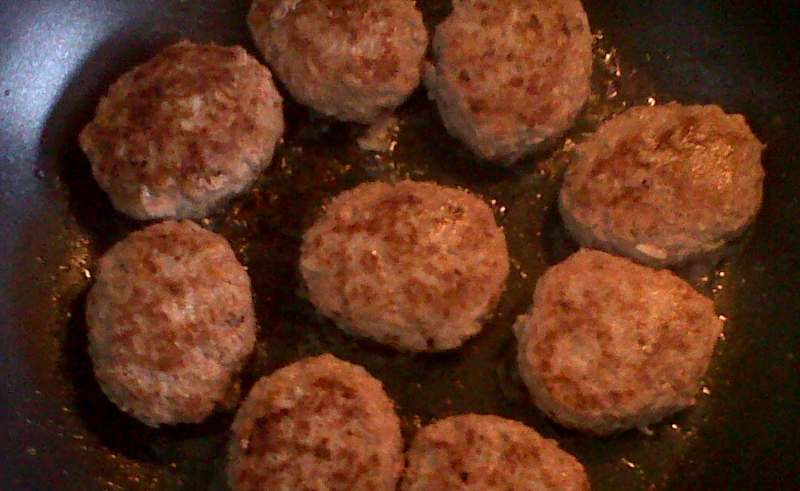 We are having many guests so I am making a large amount of fish; about 3 dozen fish patties. If you are having a smaller crowd the recipe can easily be halved. For the holidays this year, like Alex and me, be adventurous and go out on a Mexican limb! The recipe is made in three steps: The Fish Broth, The Fish Mixture, and The Veracruzana Sauce. Place all of the broth ingredients in an eight to ten quart saucepan, and bring to a boil, lower heat, cover and simmer for 15 minutes. Using damp hands take about 1/3-1/2 cup quantities of the fish mixture, shape into oval patties, and gently drop into the fish broth, which is hot but not boiling. When you have dropped the last fish patty into the broth, raise the heat to and simmer for 1 hour. Place oil in a large saucepan and heat. Add the 4 garlic cloves and sauté for a few minutes, removing them from the oil when they begin to turn golden. Add the diced onion and stir until translucent. add the minced garlic, mix for 2 minutes and then add the diced tomatoes. stir and then allow to simmer for 5 minutes. Add the parsley, bay leaves, oregano, salt and pepper to taste, and simmer 10 more minutes. After the Gefilte Fish has simmered for 1 hour in the fish broth, transfer the fish loaves to the pan containing the Veracruzana Sauce, and Retain the carrots from the fish broth for garnish. Simmer the fish in the Veracruzana Sauce for 3o minutes more, and then remove from heat. Arrange the fish patties on a platter and cover with the sauce from the pan. Garnish with the cooked carrots and fresh parsley. Gefilte Fish A La Veracruzana tastes better when served warm or hot. My Hungarian Grandma, Lily used to make these wonderful oval-shaped beef patties that were so good and soft they melted in your mouth. When my daughter Anita comes to visit from New York,these are at the top of her food request list. I have combined my Hungarian grandmother’s recipe with that of my Polish Mother-in-Law, Dora, and have come up with a delicious hybrid. Try it with beef or turkey, chicken or ground Tofu, you won’t go wrong. Saute half of the chopped onion in 1/2 of the tablespoon of oil, until it is a golden brown.Place ground meat into a large mixing bowl, add the golden brown onions and mix well. Add all of the other ingredients and mix very well with clean hands. Heat the remaining canola oil in a large saucepan, form slightly oval-shaped patties with about the amount of 1/2 cup of meat per patty, place in hot oil, and brown well on all sides over medium high heat. Place patties on paper towel to drain any excess oil. Accompany with roasted potatoes or Arroz Mexicano. It’s also great accompanied by an Israeli style chopped salad, and you can never go wrong having a little guacamole and salsa close by. Enjoy! When I was little I didn’t know about chili peppers. I only knew that I wasn’t allowed to eat those long and skinny green things that prettily decorated the white of my mother’s daily Sunny Side Up egg. Our housekeeper would pour a little bit of oil into a small frying pan. When the oil was very hot she would drop in one Serrano chili pepper. 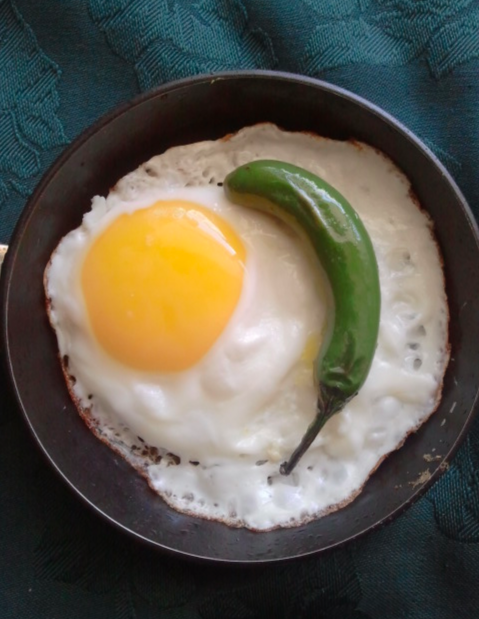 She would stir it around the spattering oil and as the skin of the pepper began to bubble she would crack the egg into the pan, she’d let it fry until the edges became crisp but the yolk was still liquid and then she would take the egg out of the pan, just the way my mother liked it. In Mexico, eating Chile was almost a test of character. You weren’t really Mexican unless you ate everything with a chili pepper or a salsa that turned your mouth into a molten lava pit. One day, when I was about 6 years old, my two older brothers, Dickie and Gary, took me aside, and dangled a fresh serrano chili pepper just above my forehead. They said, “Susie, if you eat this chili pepper we’ll give you a peso.” Not knowing what I was in for, I said, “For a peso, I’ll do it.” I took the chili pepper, bit it off at the stem and started chewing. Immediately my tongue was on fire and then my ears got so hot they felt as if they would explode. Teary-eyed, I complained to my brothers that I needed to spit the chili out. They said that if I did, they wouldn’t give me the peso. I tried so hard to keep from spitting it out, but when my eardrums began to pound louder than my heart, I spat out that wad of green chewed up fire right onto the floor next to them. Laughing, they said, “Now you don’t get the peso, you’re just a little baby who can’t take any “pica” (spiciness). “That’s not fair,” I cried. “I went through all the pain now give me my peso.” “No” they said. “The deal was that you had to swallow it, and you didn’t. No peso for you.” They went off laughing as I ran to the kitchen to nurse my injured mouth. I was initiated at a young a age by my brothers, and still, nowadays, more than 50 years later, I love my spicy chili peppers and my spicy salsas…actually when I don’t have something spicy to accompany my meals with, life is just a little bland…thank you Dickie and Gary! Kosher Paella … But How?